With the launch of the new Auris, many had feared sales of the Prius would sink in Western Europe, but that didn’t happened. 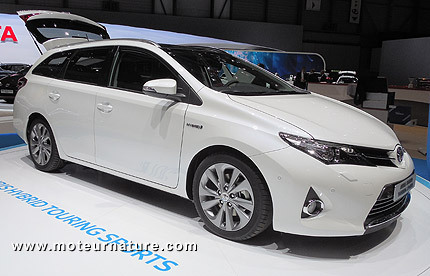 Thanks to the launch of the plug-in and minivan versions, 1,403 Prius cars were sold in France in the first quarter. It doesn’t sound impressive, but Prius sales have never been high in Europe. The little Yaris is much more successful. 6,694 were sold in the first quarter, and more than 40% were hybrids, to make the little Yaris the best selling hybrid in France. The real surprise is with the Auris. Unknown in America, it’s some kind of a hatchback Corolla, with a design more appealing to Europeans. It comes with two or four doors, with a wagon (our pic) arriving this summer. The hybrid version has been hugely successful so far, making 74% of all Auris models sold. All in all, 38% of Toyota cars sold in France in the first quarter were hybrids. It’s a new record. We may also note that in a shrinking market (-14.7% in the first quarter), Toyota sales were up 3.2%.